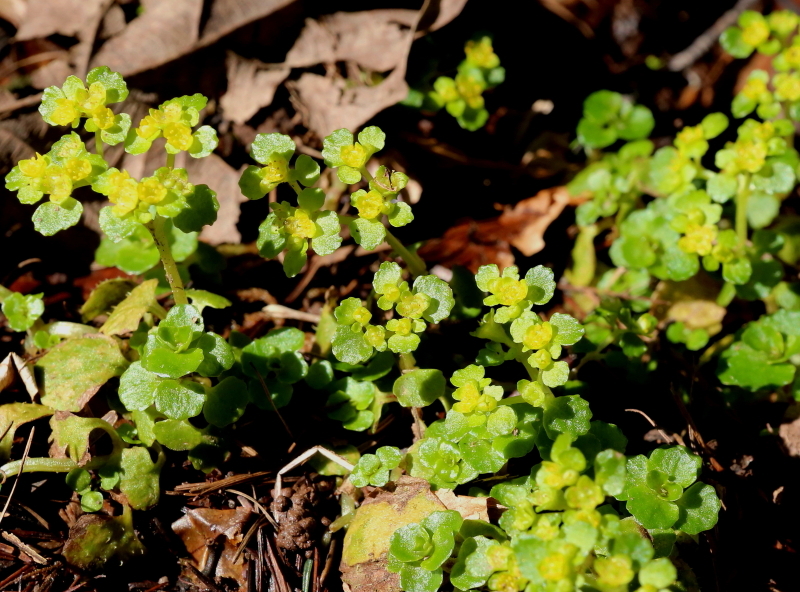 December 1, 2017 March 3, 2019 poitoucharentesinphotosLeave a Comment on Golden leaved Saxifrage, Chrysosplenium oppositifolium and Alternate leaved Saxifrage,Chrysosplenium alternifolia. Golden leaved Saxifrage, Chrysosplenium oppositifolium and Alternate leaved Saxifrage,Chrysosplenium alternifolia. These two Saxifrages are quite similar, the difference is fairly obvious from their scientific names. One has its leaves in pairs and the other has them attached singly up the stem. They do both grow along the Wye valley although so far I have only found the more common Golden or opposite leaved saxifrage. It flowers from early March through to May. The scientific name is Chrysosplenium oppositifolium which also is reflected in its other common name which is Opposite leaved saxifrage. This distinguishes it from a very similar plant called Alternate leaved saxifrage. This plant has slightly larger flowers and as you would expect its leaves are not arranged in pairs up the stem but alternately one by one. I have seen the Opposite leaved saxifrage growing in Ninewells wood and in the Whitestone area above Llandogo. It prefers wet areas, often growing in the places where puddles develop after heavy rain or wet boggy areas next to streams… It seems quite tolerant of heavy shade, but as it only grows to a height of a few centimetres, it cannot grow in places where taller plants like ferns and sedges are established. The flowers are small and a yellow green colour and the leaves, especially the upper most ones which surround the flowers, are also quite a similar colour so what you see is a yellow/green low growing band of vegetation. The leaves are also quite fleshy which is odd for a woodland plant and they have quite large white hairs on them.. Here is the distribution map for the rarer alternate leaved saxifrage as published by the BSBI. As you can see it is not that are,and is mostly in the west of Britain. Not in Ireland though. I have seen reference to it growing in woods near Tintern on the Wye valley and this is backed up by the on line distribution maps. I have had a good hunt round Barbadoes wood which is where it has be recorded in the fairly recent past but without finding it so far .Also I have had a good hunt in the Brockweir area but so far no luck.